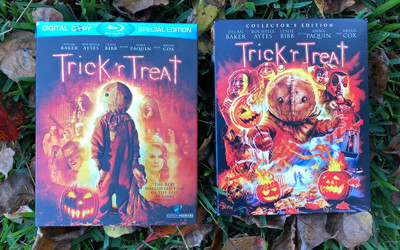 For the longest time, the Warner Bros. release of Trick 'r Treat was one of the fun "prized possessions" in my Blu-ray collection, mostly because of the rare shimmering slipcase that covered the outside … and, of course, because the film's a riot. Looks like it's going to be retired for this handsome release from Shout (Scream!) Factory, though: new artwork adorns the outer slipcase, while the inside cover design offers both that new artwork and the nifty Sam-focused design found on the film's promos and comic adaptation. 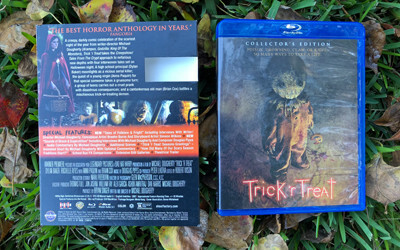 By the time Trick 'r Treat was released on Blu-ray from Warner Bros., many of the wrinkles had been ironed out in the transfer quality control department for those non-tentpole releases, so the crispness and color/shadow balance in the original Blu-ray -- a VC-1, by the way -- isn't too shabby. Shout Factory's transfer goes back to the negative for a new 2K scan, though, and drawing comparisons between the older transfer and this new 2.39:1, 1080p AVC treatment can be quite impressive. The most far-reaching comment to make about this new transfer comes in the fact that it's not nearly as heavy in saturation as the first iteration, toning down the glow of lights and the warmth of skin tones … but also allowing more natural tones to peek through, especially pinkish hues. Details have been tightened as well, from the spattering of blood to the sheen of metal and the surfaces of pumpkins, while the overall grain structure has a finer, more fluid presence throughout. Contrast balance and depth are suitable in both releases, but this new transfer sports slightly richer black elements in certain areas and appropriately lighter shadows in nighttime sequences against the rest of the lighting, and the depth created by the contrast balance ends up much more convincing in this visualization, too. Similarly, both the audio treatments for Trick 'r Treat offer up immersive, clear, satisfying pairings with the transfers, yet it's with some spot-checking that this DTS-HD Master Audio track stands above the Dolby TrueHD performance of the original. What stood out most was an increase in the width of the activity in the front channels: both possess tremendous separation and responsiveness, but this Master Audio track has fuller width from each channel and, as a result, even more credible separation in creation of a surround stage. Higher-end sounds like screams, blade snicks, and the rustling of leaves are crisp and natural throughout, while midrange and lower-end elements like the slamming of bodies against trees and on the ground have ample, tight heft to ‘em. There's some atmospheric responsiveness to the rear channels, but for the most part it's the music -- eerie piano notes and Marilyn Manson riffs alike -- that lords over the back of the surround stage, doing so unobtrusively and with a nice degree of evenness with the effects from the front end. It's a tremendous Master Audio track and a healthy step up from the previous track. A pretty even split between old and new extras can be found on the Blu-ray, in which everything from the previous release somewhat predictably shows up on Shout's thorough release. 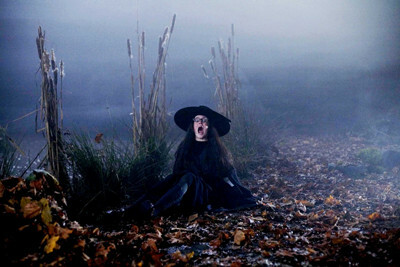 An Audio Commentary with Michael Dougherty, Concept Artist Beehn Burns, Storyboard Artist Simeon Wilkins and Composer Douglas Pipes can be played alongside the film, and the combination of these talents makes for a versatile and thorough track, not to mention jovial considering some of their mutual participation in developing the film long before it was made. They discuss shooting in Vancouver and finding a huge part of their cast there, scenes that had to be "fought" over to make the cut, script differences through drafts, lots of fun anecdotal production elements, and how they landed on how to introduce Sam in the film. The original animated "pitch" short, Season's Greetings (3:54, 4x3 HD), can also be played with optional commentary. The original release wasn't exactly light on extras, either, so it's satisfying to see the return of Trick 'r Treat: The Lore and Legends of Halloween (27:26, 16x9 HD), if for no other reason than to view behind-the-scenes footage, archival interviews with the cast, and to hear that sweet, sweet Brian Cox narration while the piece ties the real lore and legends of Halloween to the film's ambitions. There's also a quick School Bus VFX Comparison (1:13, 16x9 HD) reel, as well as some Additional Scenes (17:14, 16x9 HD) with optional commentary with Michael Dougherty. Shout Factory wouldn't be themselves without adding something else new to the mix, though, other than the new 2K mastering, so they've stitched together their own superb array of new interviews/featurettes. Complete with sketches and concept art, Michael Dougherty delves deep into the roots of the film's creation -- tied to his birthday -- and his love for Halloween in Tales of Folklore and Fright: Creating Trick 'r Treat (16:05, 16x9 HD). Following up on that, Dougherty delves into the gritty details of shooting in Vancouver with Tales of Mischief and Mayhem: Filming Trick 'r Treat (19:46, 16x9 HD), where he chats about the shooting locations and what was done on stages, using makeup prosthetics and employing a child actor inside Sam's suit, and the smartly-used lo-fi tech involved with a certain vomit sequences in the film. Shifting gears, Sounds of Shock and Superstition (11:10, 16x9 HD) delves into composer Douglas Pipes' integration into the director's sound ambitions and the ways in which he modified themes for specific effects, and Tales of Dread and Despair rounds out the rest of the discussion with the complicated release (and shelving) of the film and how it ties to the buzz and cult status it's garnered since then. A Storyboard and Conceptual Art Gallery, a Behind the Scenes Gallery, a Comic Book Gallery, the Fear.Net Shorts (9:10), and a Theatrical Trailer (2:27, 16x9 HD) top off the rest of the goodies offered with Shout's loaded release. Trick 'r Treat, an absolute blast of a Halloween movie with a decade of cult fandom now under its belt, has received an excellent new home-video release from Shout Factory. A shiny new 2K transfer, a scary-good Master Audio track, and a cornucopia of extras both old and new -- including fresh, more personal interviews that chronicle the origins and creation of the film -- should carve out a place on the shelf for this smashing presentation. DVDTalk Collector's Series.